Last year a remarkable and poignant exhibition was hosted by Gloucester City Museum to celebrate the life and art of sculptor, Patrick Conoley. It brought together well over 100 of his creations spanning a period of 75 years from his school days, when a slow descent into deafness provided the spark that ignited his talent, through to the final sculptures carved a few weeks before his death in January 2011. He felt deeply honoured when this exhibition was first proposed and was greatly enjoying the anticipation of seeing so much of his work brought together for the first time. 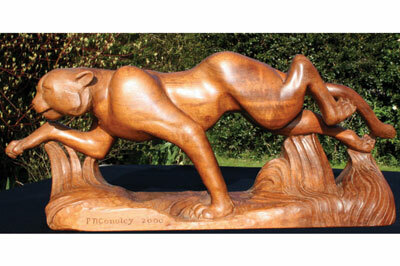 It was at school that Patrick's gift for carving was first recognised and nurtured. He was encouraged to try stone; his first chisels being forged from flattened 150mm nails and discarded iron railings. 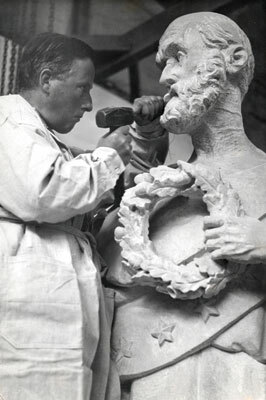 In 1941, as a 16-year-old, he was taken on by the famous firm of RL Boulton and Sons in Cheltenham where he was to become the last in a line of apprentice sculptors dating back to 1838. Throughout the 1940s and 50s Patrick's focus was on religious subjects and his carvings were representational works of art at their most realistic. He gained a formidable reputation with architects for the beauty of his faces and the graceful form of his subjects. While Patrick was to extend and develop his style, he never turned his back on Christian imagery. 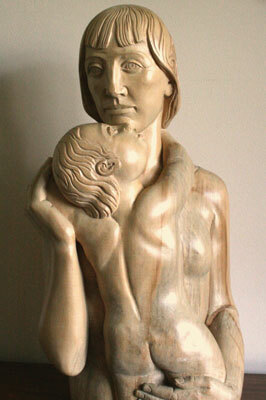 In 2005 he fulfilled his last church commission for St Peter's Church, Broadstairs, of the Virgin and Child in limewood (Tilia vulgaris). When Patrick first began his apprenticeship, it was the custom to produce a detailed drawing of the proposed sculpture for approval by the client. This was invariably followed by a full-size clay model, which was then cast in plaster. The client, usually an architect, would then come and view the cast, make comments and suggest modifications. It was only then that a sculptor would embark on the final piece. By the 1960s the prohibitive expense of doing a sculpture twice, once for a plaster cast and once for the final work meant that this practice was discontinued. When Patrick took up his chisels to begin a sculpture he felt it essential to develop the work as a whole rather than complete one part and progress to the next. In this way he was always mindful of the proportions of the emerging carving. Firstly, the outline was roughed out, to be followed by a series of progressive refinements over the entire surface as the depth of each element of the sculpture was achieved. Perhaps his most famous carvings are the 53 grotesques that span the High Street facade of Magdalen College, Oxford together with two floodlit figures on Magdalen Tower and many more inside the College. Other well-known examples of his artistic legacy are the three classical Greek figures, carved in 1965, that gaze out from the Pump Room over Pittville Park in Cheltenham, each standing almost 2.5 metres high. Towards the end of his life, Patrick was to produce a remarkable series of animal sculptures inspired by the interest he generated as Artist in Residence at 'Nature in Art' in Twigworth, Gloucestershire. Although many of these sculptures are in private collections, there are two to be viewed at Rodmarton Manor near Cirencester, as fine examples of the Arts and Crafts movement of which Patrick may well be regarded as one of the last exponents. While there are many hundreds of Patrick Conoley carvings, usually in wood or stone, on and in public buildings and in private collections throughout this country and across the world, this gifted sculptor remains virtually unknown to the wider public. Patrick never sought publicity, although he was always delighted when his skill and art were acknowledged and admired. In some small way this article and his stunning retrospective exhibition of a year ago are steps along the way to wider recognition. A biography is also in preparation.